Beer Crust Pizza - homemade pizza crust made with beer, flour and butter. Made in the food processor - super quick recipe! No rising necessary. Ready for the oven in minutes! As you know, pizza is my favorite food. We make it at least once a week. I saw this recipe for a quick pizza crust without yeast over on Karin's Viking Kitchen and I knew I had to give it a try ASAP! I love to make pizza dough from scratch, but it usually takes too much time for a weeknight. This pizza dough uses beer instead of yeast. 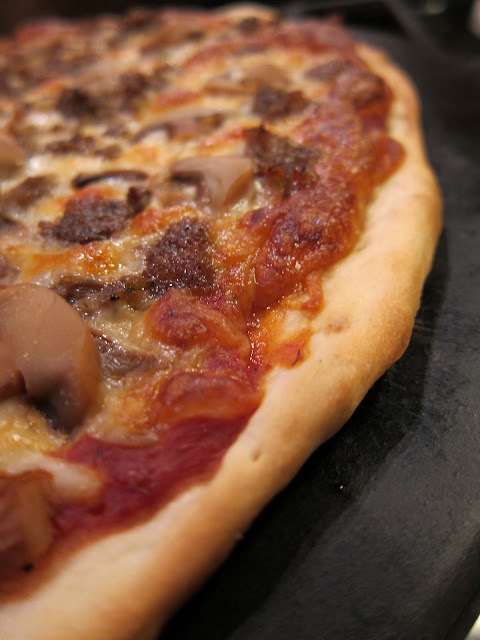 The result is a quick and tasty thin crust pizza that is on the table in about 30 minutes. We both absolutely loved it. This is our new go-to weeknight pizza dough. Give it a try for your next pizza night! Place pizza stone in oven and preheat to 475°F. Pulse the flour and salt together in a food processor fitted with a steel blade. Pulse in the cold butter until it's well distributed. Add the beer and pulse until smooth. Roll out dough onto a piece of parchment paper (I trace my pizza stone onto parchment before placing it in the oven as a guide). Prick dough with fork and add sauce, cheese and toppings. Transfer pizza to hot pizza stone. (I use a flat cookie sheet to move the dough to the stone). Bake for 12-15 minutes, until cheese is bubbly. Beer and pizza in title = must read. We don't usually make our own crust unless it's bread day but this may change that. Excellent idea and I love your close-up shot. which stone do you have? I have one of the PC stones (I also have a slight PC addiction) but I didnt think you could preheat those. Okay, I think I can make this one. susie - I have the pampered chef stone as well. I preheat it all the time - I've never had a problem. My family and I love making homemade pizza I am going to try this in the next few weeks. I just sounds amazing. I seen Beer and I was sold. Hi Steph! So glad you liked the pizza crust! I spent the better part of the summer getting it just right and I'm thrilled you included it on your blog. Wow! This is something new! Beer in the crust! Bookmarking this! Thanks for sharing! I'm making this tonight and have two quick questions... can it be made ahead and frozen or stuck in the refrigerator? Also, if my food processor is too small, can I use my hands to mix it all together instead? Thanks! Stephanie - I haven't tried freezing or refrigerating the dough. I just make it right before we want to eat it since it only takes a few minutes to make. I'm not sure how that would work since there is no yeast in the dough - I need to experiment with that in the future. You can use your hands or even your mixer to make the dough if your food processor is too small. This makes me very happy, I bet the flavour is awesome. Beer tastes good in so many things! I made this and wrote about it here. I had quite a bit of trouble getting the crust to cook all the way through. I'm guessing this was because I didn't have a pizza stone? I used this recipe this evening for the third time this month, and I just have to say I'm in love with it. Not only is it delicious, but so incredibly quick and easy as well. I just use a cookie sheet (until I get a nice pizza stone) and pre-bake it for about 10 mins before adding the toppings. A million thanks to you for sharing this recipe!